Time to spend some times and create something in the kitchen. 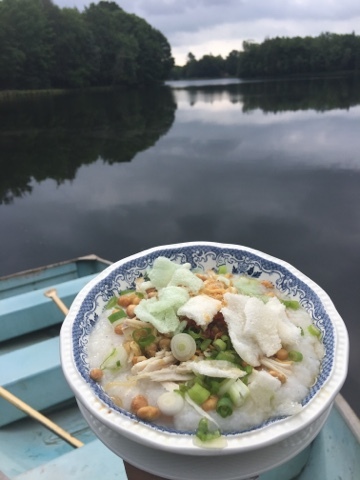 We are in the middle of our midsummer break and away from home, but we are trying to bring the homey feeling through our favorite food. 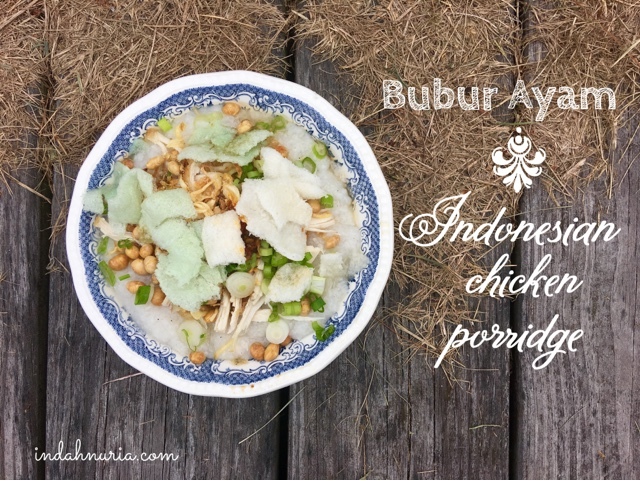 One common breakfast meal that you can find in Indonesia is bubur ayam - or Indonesian chicken porridge. Some might find the preparation for this meal a bit complicated as bubur ayam has many condiments require to make it a complete dish. But again, it tastes wonderful so it worth all the efforts. Back home, bubur ayam can easily be brought from the food vendor, including the mobile one who's coming to your front door. Here in New York City, some authentic Indonesian restaurant has bubur ayam on their menu. As I love this food, I learn how to cook it properly. 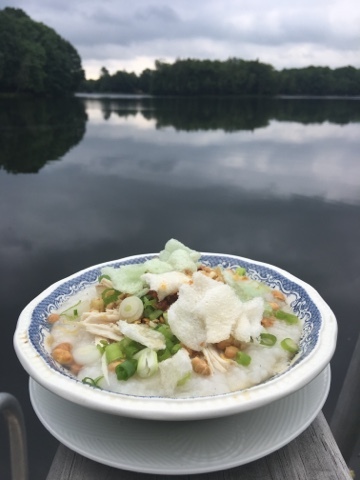 What makes it different from other porridge is the condiments and some spices used for this Indonesian chicken porridge. I put ginger and lemongrass to give extra flavor and aroma. On our last trip to Pennsylvania, I had it before rowing our boat on the lake. Feels like heaven eating my favorite food while enjoying nature's beauty. Some love to add cakue or like fried salty Funnel cake which make the porridge more like a chinese-style one. I don't usually add it but it's nice as well. Clean the rice and add the chicken broth as well as the rice and a few cups of water in a cooking pot. I usually use 5 cups of water, including the broth. You can definitely use rice cooker as well but I prefer using the cooking pot because We need to stir it frequently until the rice has reach a certain consistency as porridge. Put the ginger and lemon grass as well as shallots and keep stirring for about 30 minutes. Once it starts getting ticker, use low heat to avoid burning. 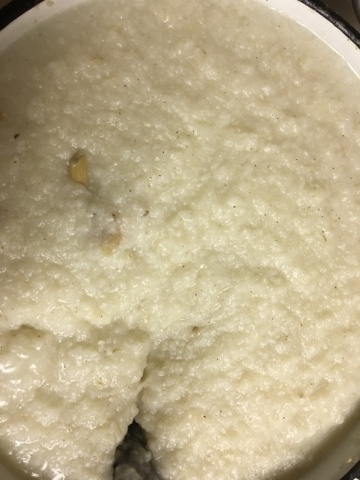 The porridge is well cooked after it's tick enough and not runny. This is how it looks :). For the soup, we simply make clear soup from chicken broth. If you like and you want to add some colors, you can add turmeric. Once everything is ready, put the porridge in a bowl and give all the condiments you like on top of it. Enjoy your bubur ayam - Indonesian chicken porridge:). Setujuu mba, makan makanan kesukaan aat liburan itu surgaaa banget. Aku wkt fi aceh, makan lontong sayur di pinggir pantai, aduuh, nikmaaattt bgt. Woww... mantep nih makan buryam plus pemandangannya yg aduhai banget. satu yang kurang mba, warna kecap nya.. aku paling suka sama chicken porridge yang lumayan banyak kecap manis nya, dan sambel nya.. beeuuhhh.. enak diliat, yummy dimakan hihihii.. btw aku follow GFC nya ya mba #170 di tunggu follback nya hehhehe.. It looks so flavorful and filling. I'd love to try a bowl. Yum Yum!